On the 14.01.2016. 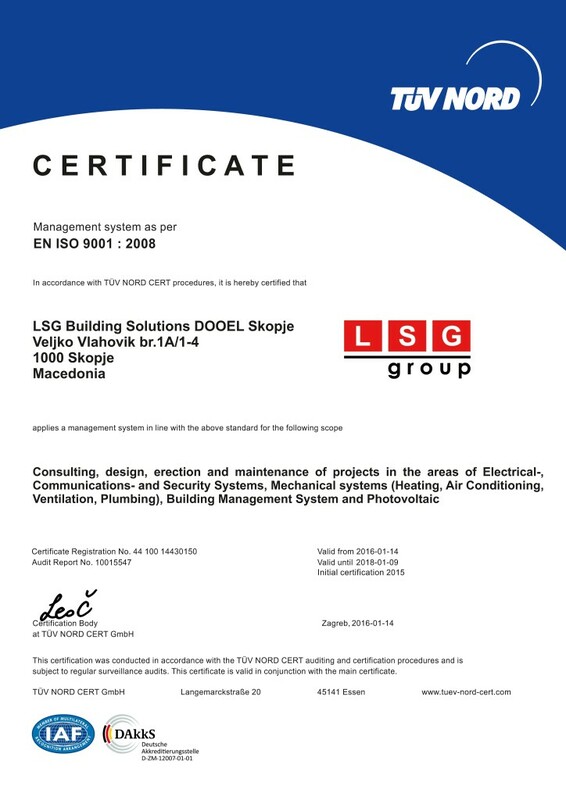 LSG Building Solutions DOOEL Skopje was awarded the certificate confirming that our company has developed and implemented the Quality Management System that complies with the requirements of international standard ISO 9001: 2008. Certificate applies to the business activities: Consulting, design, erection and maintenance of projects in the areas of Electrical-,Communications- and Security Systems, Mechanical systems (Heating, Air Conditioning, Ventilation, Plumbing), Building Management System and Photovoltaic. Certification of the Quality Management System was carried out on the 11.12.2015. in accordance with the TUV NORD CERT procedures for auditing and certification.